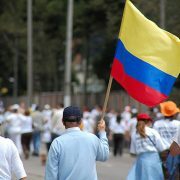 In this article Oliver Dodd examines the processes of capitalist development to account for the underlying dynamics of the Colombian Civil War (1964-2002). Oliver argues that economic development did not take place in an orderly or steady manner, but rather involved conflict and antagonism between various social-class forces engaged in a ‘struggle for hegemony’. The article, therefore, concludes that it was capitalist development in Colombia which led directly to the political violence of the Civil War. Oliver Dodd is starting a PhD in September 2018 examining Colombia’s 2016 peace agreement. He completed a masters in International Relations at the University of Nottingham and undergraduate studies at Aberystwyth University. His MA dissertation sought to explain the underlying dynamics of Colombia’s armed conflict. Oliver regularly conducts ethnographic research in Colombia, and as part of such field-work has spent five-months observing the National Liberation Army of Colombia (ELN).